Keyesville. Cool, Beautiful Keyesville. Our northernmost venue beckons. The photo above shows my friend Peter Croft, or "Crofty" if you will, attaking one of one million perfect trials rocks in the area. Make plans now for riding this special event. 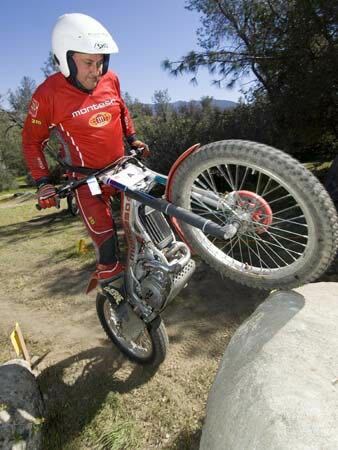 Plan on spending the weekend of April 26th in the southern Sierras with me and Crofty riding the Keyesville Trial. Help set up the weekend before and on Friday prior to the trial. Help if you can. I will see you there. I cannot wait! PSST! This just in! Results from the Shamrock trial are posted!